INO Weather Pro provides lightning detection to help protect construction crews. 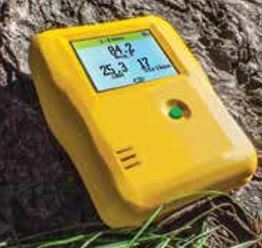 INO Technologies has introduced the INO Weather Pro, a handheld device that combines area and weather data, such as heat index, altitude and dew point, with lightning detection to help protect construction crews. Although most lightning-detection technology relies on national weather data feeds and requires an internet or cellular connection, the INO Weather Pro has its own sensor providing real-time local lightning detection and direction. The tool detects the distance of cloud-to-ground lightning strikes as far as 40-miles away, providing visual and auditory feedback of lightning-strike distances. With an updatable software interface and a touchscreen display, users are able to customize their dashboards with the information most important to them. The portable device is water resistant and runs on a USB-charged lithium battery.